When the bluetooth of a mobile phone is turned on, a device named 'ECO 105' is shown as available, Congress' Porbandar candidate Modhwadia said. AHMEDABAD: Senior Congress leader Arjun Modhwadia today complained of possible EVM tampering at three polling booths in a Muslim-dominated area of Porbandar claiming that some machines were found to be connecting to external devices via bluetooth. The Election Commission said that based on the Congress leader's complaint, an inquiry had been initiated. "We detected that the EVMs at three polling booths at Memanwada, a Muslim-dominated area, are connected to external devices through bluetooth. When the bluetooth of a mobile phone is turned on, a device named 'ECO 105' is shown as available," Modhwadia, the Congress candidate from Porbandar, said. This clearly means that the Electronic Voting Machines (EVMs) can be tampered with using the device via bluetooth, he alleged. 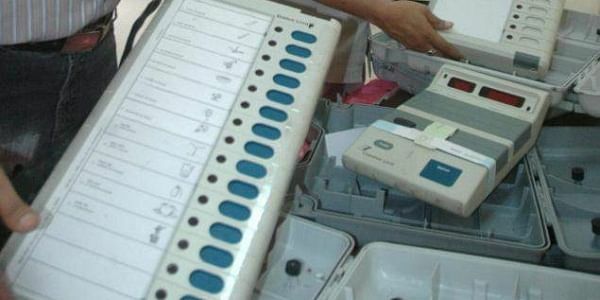 "The chips fitted in the EVMs appear to be programmable using bluetooth, and this raises the possibility of tampering. The voting system should be immune to such connectivity to external devices," he said. Modhwadia said he had registered a complaint with the district election officer. The election officer visited the booth and saw the display, he added. Chief Election Officer (CEO) B B Swain said an inquiry was ordered into the matter and the collector and the observer of the Election Commission (EC) were sent to the spot. "We received a complaint regarding the connectivity of EVM through bluetooth. After discussing the matter with the Election Commission, we have sent the collector and an observer of the commission has been sent to the spot along with the senior-most engineer. An inquiry is being conducted in the presence of the complainant," Swain said. The ruling BJP, however, said the complaint made by Modhwadia shows the opposition party's "search for an excuse" as it knows that it would bite dust in the election. "Members of the Congress are saying there is a defect in the EVMs. The EC would respond to it. But we can say that the Congress is searching for an excuse even before the results are out, as it stares at a loss in the elections. They are trying to hide behind the EVMs," BJP spokesperson Sambit Patra said.